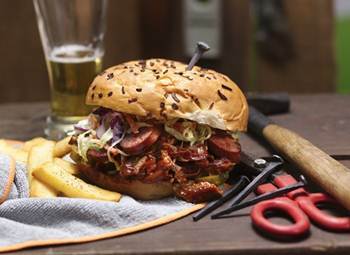 Betty Crocker sent me these amazing party food recipes that are all beer-infused. In all, they have 16 recipes and you can even vote for your favorites to win the second annual “Betty Bracket” presented by Betty Crocker and sports-loving actor and popular TV personality Mario Lopez. Be sure and go vote for your favorite! 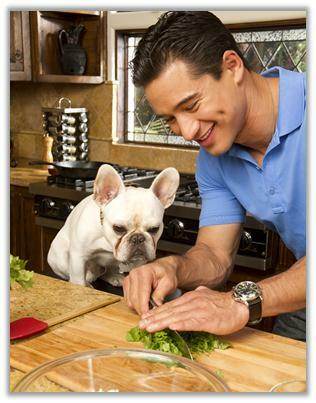 Mario with his favorite cooking assistant – Julio Cesar Chavez Lopez! 2.Line large cookie sheet with cooking parchment paper. 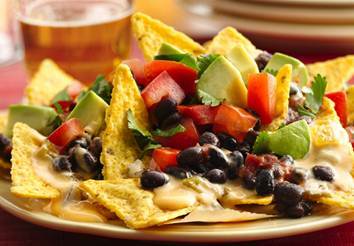 Arrange tortilla chips on cookie sheet. Bake 5 minutes to warm chips. 3.Meanwhile, in 2-quart saucepan, heat beer over medium heat until just starting to simmer. Slowly add the cheeses in small amounts, stirring constantly with a whisk, until melted. Stir in chiles. 4.In a medium bowl, mix beans and salsa. Microwave uncovered on High 2 to 3 minutes or until hot. 5.To serve, pour half of the cheese sauce over warm chips; top with half of the bean mixture. Top with remaining cheese mixture and remaining bean mixture. Serve with remaining ingredients. 1.In 12-inch nonstick skillet, cook bacon until crisp; drain on paper towel. 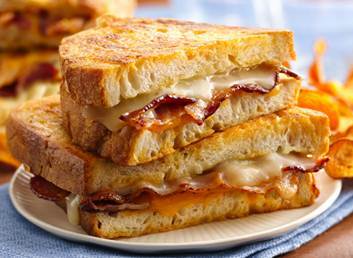 2.On 2 of the bread slices, place 1 slice provolone cheese, 3 slices bacon, and 1 slice Cheddar cheese on each. Top with remaining bread slices. 3.Heat griddle or skillet over medium-high heat or to 375°F. In a shallow bowl, beat egg, beer, flour and chili powder with fork until smooth. Dip each sandwich into batter, giving it a few seconds on each side to absorb the batter; drain excess batter back into the bowl. 4.Melt butter on hot griddle. Place sandwiches on griddle. Cook 3 to 4 minutes on each side until golden brown. 1.In 2-quart saucepan, heat sauce ingredients to boiling over medium heat, stirring frequently. Reduce heat to medium-low and simmer 20 minutes, stirring occasionally to prevent scorching. 2.In medium microwavable bowl, place chicken; cover. Microwave on High 4 to 5 minutes or until hot. Add shredded chicken to sauce in a saucepan, stir to coat. 3.Place about 1/3 cup chicken mixture on bottom of each slider bun; top with bun top. Garnish each sandwich with a green olive. 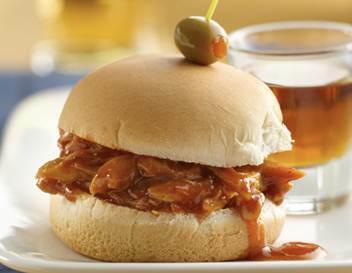 1.Place pork in 3 1/2- to 4-quart slow cooker. In a small bowl, mix 1 cup of the barbecue sauce, the beer, seasoned salt, garlic-pepper blend and ground mustard. Pour over roast. Cover; cook on High setting 4 to 5 hours or Low setting 8 to 10 hours until pork is very tender. Remove pork from slow cooker, and discard liquid. 2.When cool enough to handle, shred pork into bite-size pieces; discard any excess fat. In a large bowl, stir together remaining 1 cup barbecue sauce and the shredded pork. 3.In 10-inch skillet over medium heat, cook sausage slices until heated through and crisp around edges. 4.In a medium bowl, stir together coleslaw mix and dressing. To make sandwiches, pile pork mixture, smoked sausage, coleslaw and pickles on buns. Serve immediately. 1.Heat oven to 350°F (325°F for dark or nonstick pans). Grease bottoms only of three 9- or 8-inch round cake pans. Make cake batter as directed on box, using a cake mix, beer, the oil, and eggs. Pour about 1 1/2 cups batter into each pan. 2.Bake 18 to 22 minutes or until a toothpick inserted in center comes out clean. Cool 10 minutes before removing from pans. Cool completely. 3.Meanwhile, for frosting, place chocolate in medium mixing bowl. In 2-quart saucepan, heat whipping cream and butter to just boiling over medium heat. Pour cream mixture over chocolate; stir with a whisk until melted and smooth. Cover and refrigerate about 3 to 4 hours or until spreading consistency. 4.Place 1 cake layer on serving plate. Frost top of the layer with 1 cup of the frosting. Drizzle with 3 tablespoons caramel topping. 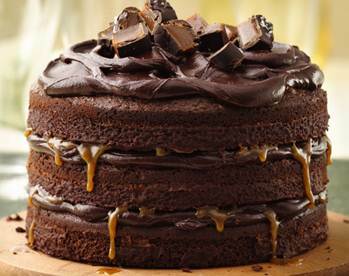 Top with another cake layer, 1 cup of the frosting and remaining 3 tablespoons caramel topping. Top with remaining cake layer and frosting. Garnish with chunks of chocolate covered caramels with sea salt, if desired. Refrigerate cake at least 2 hours before serving. Store loosely covered in the refrigerator. 1.Heat oven to 450°F. 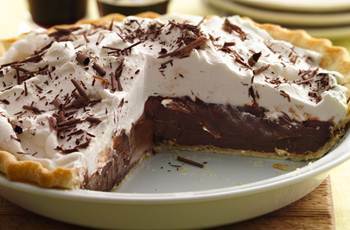 Make pie crust as directed on box for One-Crust Baked Shell, using 9-inch glass pie plate. Cool completely, about 15 minutes. 2.Meanwhile, in 2-quart saucepan, cook milk, beer, and pudding mix over medium heat 5 to 8 minutes or until mixture comes to a full boil, stirring constantly. Remove from heat. Stir in chocolate chips until melted and smooth. Pour into medium bowl; cover the surface of pudding with plastic wrap. Refrigerate about 2 hours or until cold. 3.Spoon and spread pudding mixture evenly into crust. Refrigerate at least 4 hours until set. 4.Just before serving, in chilled medium bowl, beat topping ingredients with electric mixer on high speed until soft peaks form. Spread over top of pie. Garnish with chocolate shavings, if desired. Store covered in the refrigerator. 1.Heat oven to 350°F. Spray bottom and sides of 13×9-inch pan with cooking spray. Place cookie mix in bowl; cut in butter using pastry blender or fork until mixture is crumbly. Reserve 1 1/2 cups mixture for topping. Press remaining mixture in bottom of the pan. Bake 10 minutes. 2.Meanwhile, in a large bowl, beat cream cheese, sugars, flour, 1/3 cup beer, the vanilla and egg with electric mixer on medium speed until smooth. 3.Spread cream cheese mixture evenly over partially baked cookie base. Sprinkle with reserved crumb topping, pecans, and toffee bits. 4.Bake 35 to 40 minutes or until light golden brown. Cool 30 minutes. Refrigerate about 2 hours or until chilled. For bars, cut into 8 rows by 4 rows. 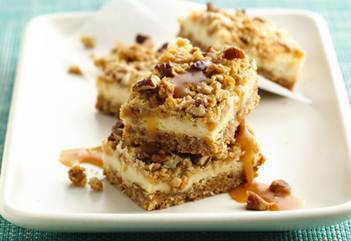 To serve, stir together caramel topping and 1 tablespoon beer; drizzle over top of each bar. Store covered in the refrigerator. 1.Heat oven to 350°F (325°F for dark or nonstick pans). 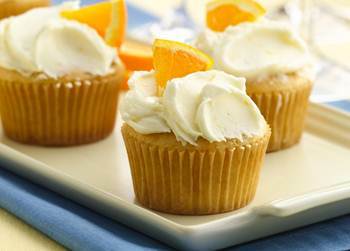 Place paper baking cup in each of 24 regular-size muffin cups. 2.Make cake batter as directed on box, using a cake mix, 1 1/4 cups beer, the oil, egg whites and egg, coriander and ginger. Stir in 1 teaspoon orange peel. Divide batter evenly among muffin cups (about two-thirds full). 3.Bake 18 to 23 minutes or until a toothpick inserted in center comes out clean. Cool 10 minutes; remove from pans to cooling rack. Cool completely, about 30 minutes. 4.In a large bowl, beat frosting ingredients with electric mixer on medium speed until smooth and creamy. Frost cupcakes. Just before serving, garnish each with an orange wedge. Store loosely covered in the refrigerator. Don’t those recipes look and sound amazing?! Now for a few cooking with beer tips. Are you inspired to whip up one of these recipes? I am definitely going to try one salty and one sweet beer-infused recipe. I’ll report my success and thoughts in another feature.